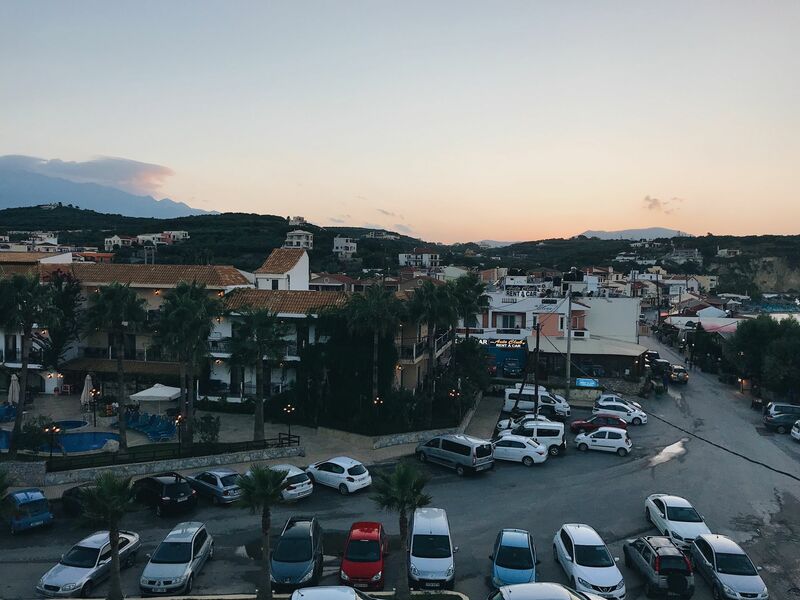 My family and I have travelled to Crete several times before, and each time we’ve stayed in the gorgeous town of Almyrida. Why? Because it’s one of those places you feel the need to go back to after every visit! 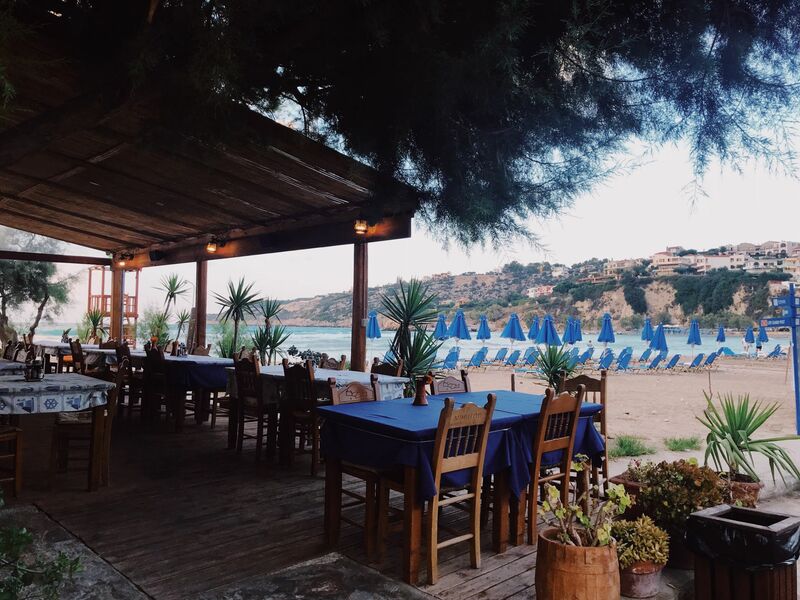 Almyrida (which is sometimes also spelt: Almirida) is located on northwest coast of Crete, about 45 minutes away from the large town of Chania. 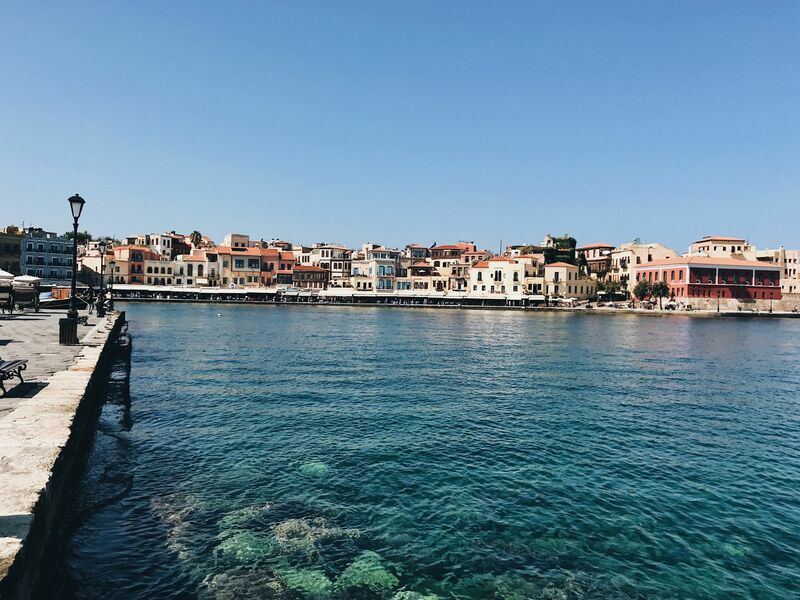 Chania is also home to one of the islands two international airports, meaning the village isn’t far to travel to after your flight. I’d suggest hiring a car on your visit to Almyrida Crete as public transports connections between here and the airport aren’t the best. What’s more, at 8,000km², Crete is the largest of the Greek Islands. Therefore, a car is by far the best way to travel around and explore all it has to offer. 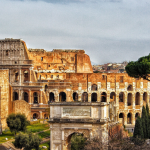 SIDE NOTE: if you’re staying at one of Almyrida’s hotels you may not need to hire a car as they’re likely to offer you a free transfer to and from the airport. The two main hotels in the village are actually owned by the same company (Almyrida Resorts). However, each has its own ‘vibe’ and slightly different target audience. By far my favourite is the Almyrida Residence hotel which has a modern, elegant feel. 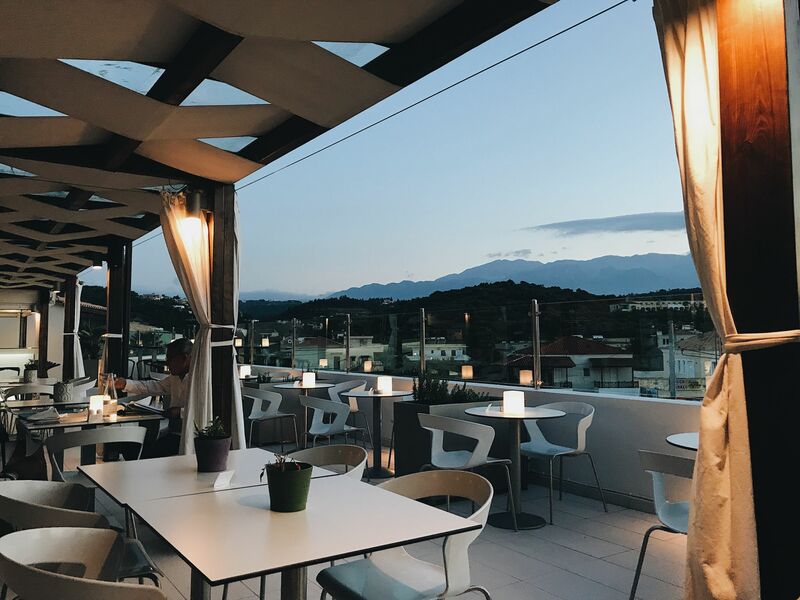 Its rooftop pool is to die for and its terrace is also home to one of the best restaurants in Almyrida (read more on this below). The hotel even has its own bowling alley which is pretty cool! The second is Almyrida Beach hotel which is slightly more outdated but seems to me to be more kid-friendly with its bigger pool. Despite their benefits, I do feel that I should mention that both hotels back onto a busy carpark. In-fact most rooms face onto the said, carpark. So if you’re dreaming of beautiful beach views you might be disappointed. However, Almyrida Residence and Almyrida Beach Hotel are still great accommodation options overall! Almyrida is also home to some of the most beautiful villas in Crete. My family and I usually opt for this accommodation option as there’s nothing more peaceful and relaxing than having your own space. There are some Villas located close to the villages main shops and restaurants. However, these tend to get booked up quickly and are a lot more expensive. Therefore on my visits, we’ve tended to stay slightly out of town. This year we actually returned to the villa we stayed out on our last visit because we loved it so much. I can’t find fault with its beautiful pool and rooms! 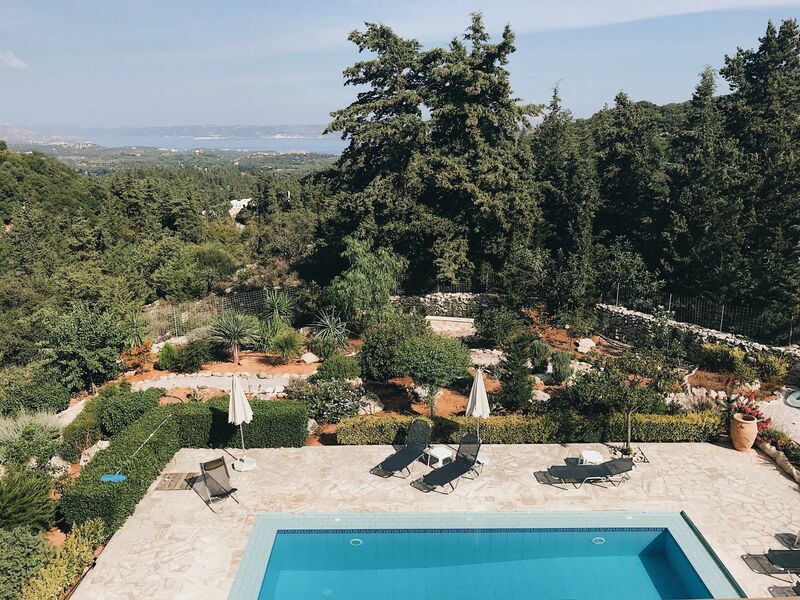 Villa Kournedes comes equipped with everything you could need for your stay, from pool inflatables to every kitchen utensil under the sun. More than this, it’s located out of town (up in the mountains) meaning that the Villa has breathtaking views of the coast! SIDE NOTE: as they’re located a little far out Almyrida to walk into the village, if you opt to stay in a villa like Kournedes then you really will want a car! A happy medium between Villas in Crete and hotels is the accommodation option of apartments. There are several apartment complexes in Almyrida that sit right on the beach and come equipped with their own pool. Almyrida Crete is quite a small village. This said it does have access to most of the basic amenities you could want. For one there’s a glorious bakery that sells the most amazing cakes and pastries! There’s also a butcher and several small grocery stores. 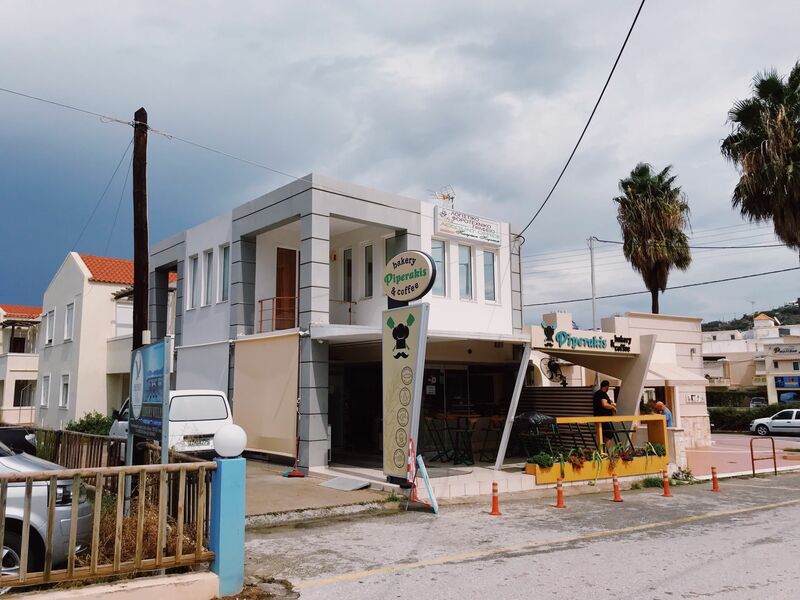 This said if you’re looking for stores with slightly more variety, there’s a larger supermarket in the nearby town of Kalyves Crete. Likewise, the Town of Vamos (located higher in the mountains) has a very helpful health clinic and pharmacy should you need it. TOP TIP: You would need to drive to both of the mentioned towns, so again a car is handy to have at your disposal when staying in Almyrida Crete. Now onto the fun part of my guide to Almyrida, what there is to do… As it’s only a small village there aren’t tons of things to get your teeth into. This said I’ve found that there has been plenty to keep me and my family busy over the years! A large part of Almyrida is framed by a beautiful beach which means there are many different options of where to spend a beach day! My favourite part of Almyrida Beach is the stretch of sand nearest the villages small harbour. Here the sand is at its softest and the water is very shallow, making it perfect for families. For those looking for a little more excitement, there’s a small shop in the centre of the village (just to the right-hand side of the carpark) which offers the opportunity to hire Paddle-boards, Kayaks and Windsurfing equipment. On the last day of our trip this year, my dad and I decided to hire a Kayak and paddled around the small island which sits just outside the bay. This was great fun and provided a wonderful perspective when we looked back onto the village. Sticking with the sea, something you must do in Almyrida Crete is go on a Snorkeling trip. Dream Adventure Tours offers a fantastic day trip, it stops off at many crystal clear snorkelling spots and even offers you the chance to explore a secluded hermits house which is perched on the cliffs. 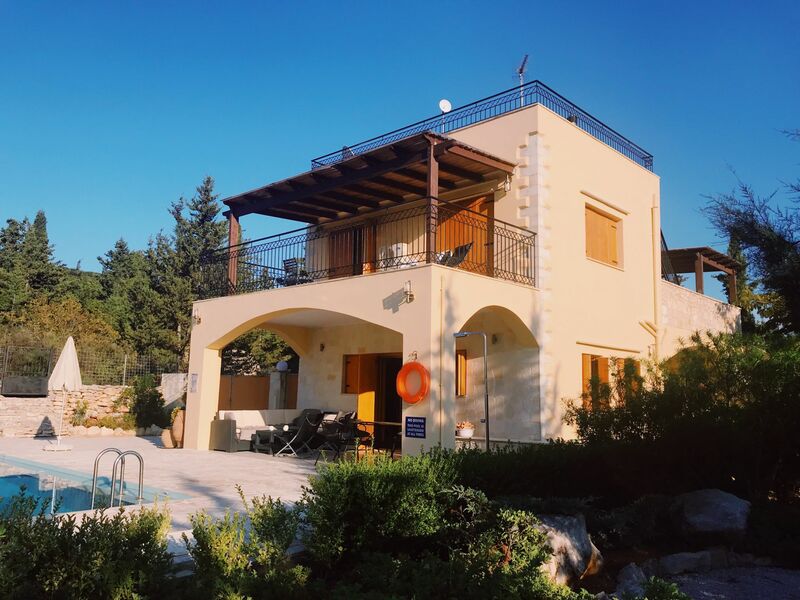 My parents went one step further in exploring the beautiful waters around Almyrida and booked two days worth of diving trips with the Omega Dive school, which is located in the village. They had great things to say about the company, especially their instructor: Freya. Chania – this airport town has a fantastic harbour area that is filled with lovely shops and restaurants, there’s even a lighthouse. Knossos – These Ruins are said to belong to the oldest city in Europe. (I have to say though that we were a little underwhelmed) However, it’s still a must visit if you’re into Greek history. 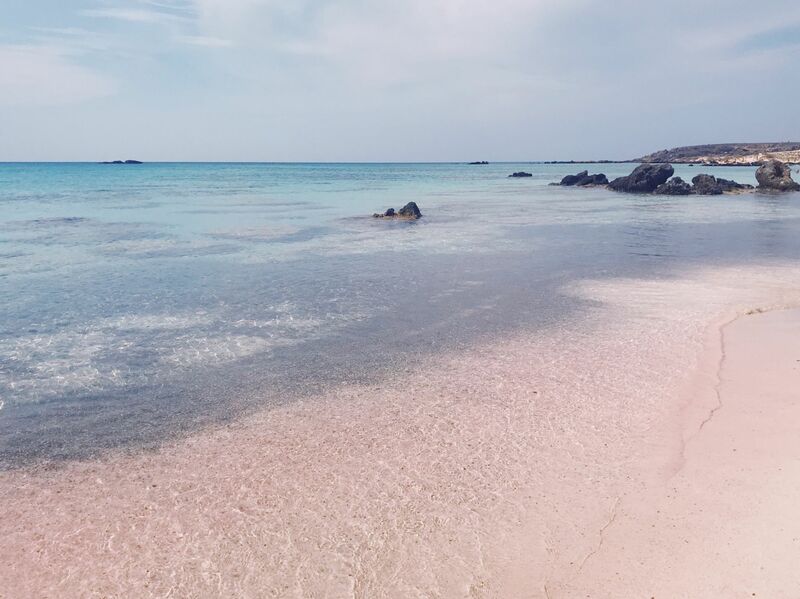 Elafonisi beach – Slightly further away from Almyrida (but still more than worth the visit) this beach has been voted as one of the top 10 beaches in the WORLD. Another fantastic beach location is Balos Bay. 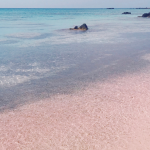 Read my guide to visiting Elafonisi Beach! This is by far the best restaurant in Almyrida! Located on the edge of the town, this family-run establishment serves homemade food of the highest standard. Their speciality is beef stifado which is simply to die for! 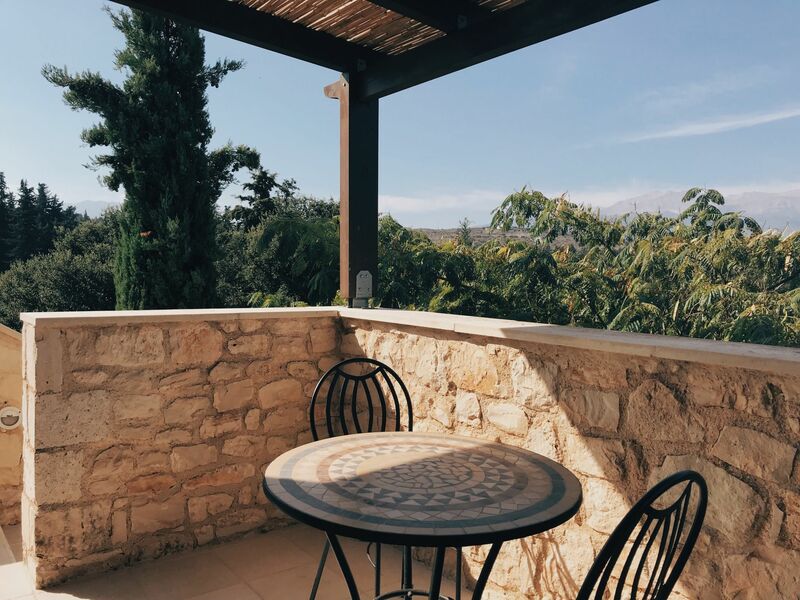 Part of the Almyrida Residence Hotel, the Thea Roof Garden provides a wider variety of dishes with more of a European feel, meaning a visit provides a break from traditional Greek dishes. 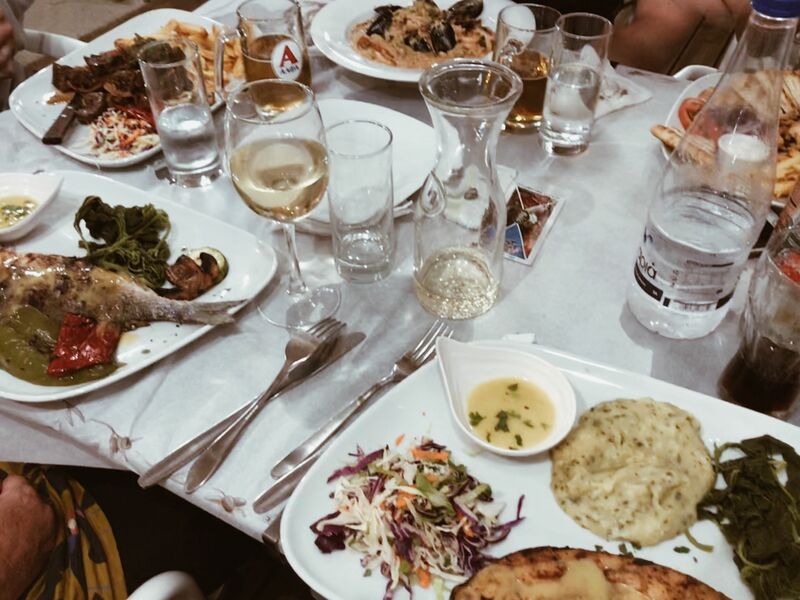 Another of Almyrida’s restaurants that deserves a visit is Psaros (which you can actually order takeaway from). The portions here are massive so be warned but the food is delicious! So that completes my guide to Almyrida Crete. 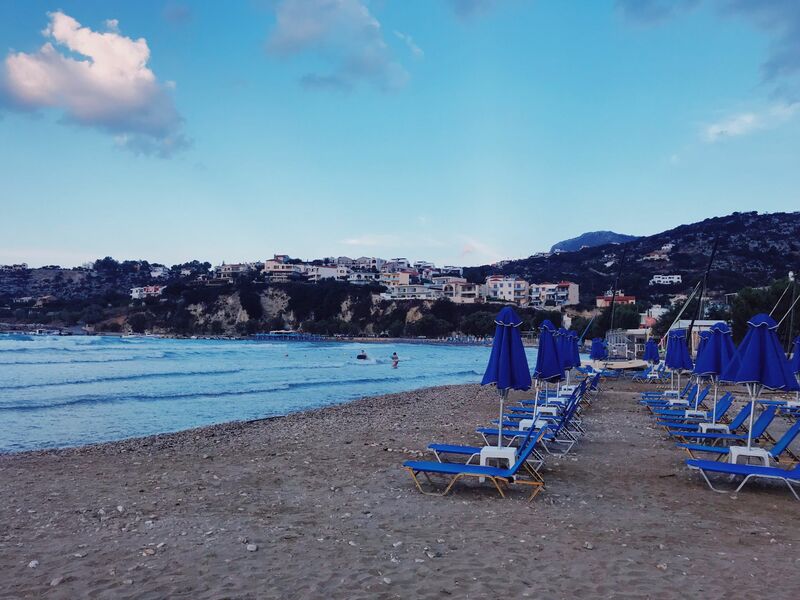 I love this little village so much so I no doubt will return in the future, even if only to visit the Gorgeous Almyrida Beach and sample the delicious Greek Food! 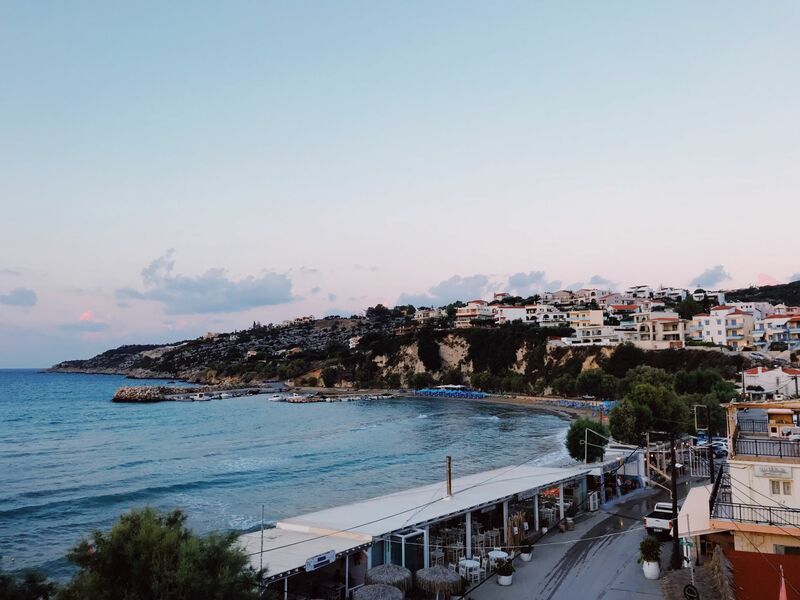 I’m planning a trip to different islands in Greece so this post is really helpful for visiting Crete. Also- I had to google the beef stifado after you recommended it, and it sounds amazing! I have never even heard of this place, but it seems like a must! As a history geek, Knossos intrigues me, though it’s a shame were were underwhelmed. I had no idea the oldest European ruins were in Crete! Wow, Nice pictures and place. I have always heard about Santorini and others, but this is also amazing to give a visit to. Crete is 100% on my list of places to visit, and this town looks amazing. I love the look of the food as well. I will definitely need to give your guide a try. Sounds like a perfect holiday destination, a bit away from the city. Greek food looks so delicious. And also possible to enjoy the beach time. Loving the beauty of Elafonisi beach. Crete looks gorgeous! And the food sounds delicious. I’m not a huge beach person, but I love little villages so I think Almyrida would be the perfect choice for me. This looks like a lovely place for a late summer holiday! I love how quiet it is and the food looks delicious. I have never been to Crete of that part of Europe before but would love to explore at some point. I haven’t heard of Elafonisi beach as one of the top ten in the world but looking at your oic it seems stunning! Love all the local addresses and insider tips. Thanks for reading! I hadn’t heard of the beach either before visiting! So many lovely beaches! And the idea of staying in a villa on a Mediterranean island pretty much sounds like my dream vacation. Love that it’s a small town, too — but is it a big tourist area? Two hotels plus apartments and villas actually seems like quite a lot for a small place. Does it ever feel crowded? Nope I’ve never found it crowded! Sure its a ‘holiday destination’ so the town is prepared for tourists (hence the number of restaurants) but its maintained its charm and nothing like big resort areas I’ve been to in the past!